John Hunter and the Secrets of Davinci’s Treasure is a slot designed by Pragmatic Play having 5 reels and 25 fixed paylines. Few impressive features are present that can fetch you some lucrative wins. 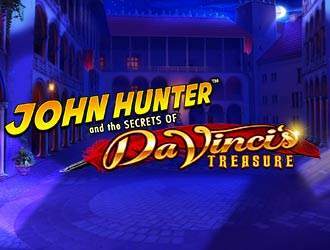 John Hunter and the Secrets of Davinci’s Treasure – Are you ready for Treasure Hunt? The winning combinations are formed in left to right direction. A variety of symbols is present from playing cards to the symbols related to the theme like a backpack, various statues and a bow. John Hunter himself is the most lucrative symbol as it will pay you a prize worth 48,000x the bet amount. The wild symbol is Da Vinci which will appear on the reels 5, 4, 3 and 2. Moreover, it can substitute each symbol except for bonus symbol. If you spin a bonus symbol on the reels 4, 3 and 2, 1 out of 3 bonus games will get triggered. These bonus games include free spins along with mutlipliers, prize picker and lastly a map quest bonus game. In Prize Picker round, you need to pick 1 out of 3 artworks made by Da Vinci that will award a cash prize instantly. In Map Quest Bonus, the Fortune Wheel will be spun and will take you to a map for beginning with the treasure hunt to search for Da Vinci’s treasure. While you search, all along the way, you will be awarded points and each point will fetch you a cash prize worth 100 times the amount at stake. Note that the round will terminate if Wheel of Fortune spins and lands on “Game Over”. In John Hunter and the Secrets of Davinci’s Treasure, the Free Spins round will begin along with free spins up to 12 and a multiplier i.e. 1x. Every free spin will increase the multiplier by 1x. Note that free spins have the ability to be re-triggered and that too for free spins up to 60. Well, a gamble feature is also present in which you can gamble up to 5 times your win. So what are you waiting for? Go ahead and pick up your win. John Hunter and the Secrets of DaVinci’s Treasure is a slot with pretty high volatility and the 3 bonus features that are triggered randomly. Many impressive payouts can come your way if lady luck is on your side. Overall, the slot is a good one from Pragmatic Play.